Authentic to the last, the Waterloo may divide opinion, but its tone is vintage country-blues pickin' nirvana. An instrument of substance and character. Fantastic vintage blues and folk tones. Build quality. Finish imperfections (although purposeful) won't be for all. Not an all-rounder. By all accounts, nobody quite knew where to look as it was being discussed. Proposing his Waterloo range, Bill Collings was deadly serious about building an authentic remake of Gibson's Kalamazoo-style guitars - glue splodges, matte finishes, vintage playability traits and all - right there in the same factory as his meticulous, high-end instruments. He'd become fascinated by the original Kalamazoos, particularly the way in which they combined utilitarian build with a unique tone and character. The Kalamazoo range was introduced by Gibson in 1934, as a way of propping up the company's sales during the Great Depression. Given their cost-conscious designs, they didn't bear the Gibson brand, instead using Gibson's home town as a name. "There's a depth and maturity to the Waterloo's timbre that immediately brings to mind the best country-blues-roots masters"
These days, while they don't command the value or wow-factor of their vintage Gibson cousins, their simple charm and evocative tones mean they're still loved, cherished and collected by many players and enthusiasts. Finding an old one in playable condition isn't always easy, however, so to complete today's history lesson, we turn to 'Waterloo', a town that some time in the mid- 1800s became known as Austin, Texas, home town of the aforementioned Collings Guitars. Everyone clear on how we got here, then? The Waterloo WL-14 is based on the 375mm (14.75-inch) wide Gibson L-00 shape, and comes in two variants: one with an X-braced, solid spruce top that Collings says has a more even response and definition across the frequency range; the second using a ladder-braced pattern that's said to be louder, more percussive and with stronger upper- mids. We'd say the latter is more overtly 'vintage' based on the ones we've heard thus far, though neither sounds in any way 'modern'! The WL-14s are also available with an adjustable truss rod in the thick mahogany neck, or the more vintage-correct, fixed metal T-bar arrangement, just like the original Kalamazoo KG-14 models. You can have any combination of bracing and neck reinforcement you like. Interestingly, early in his career as a guitar repairer, Bill Collings discovered that T-bar Martins, for example, had a very even tonal response across the fingerboard compared with truss-rod equivalents, one reason that his modern Collings instruments have small steel inserts either side of the truss rod to this day. 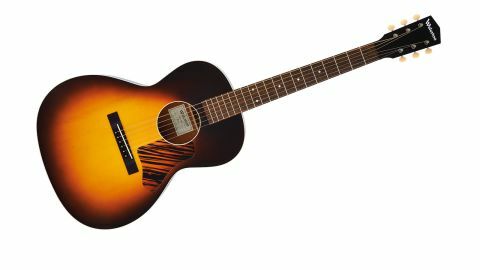 Our review guitar has the X bracing and the T-bar; with solid mahogany back and sides and the minimal ivoroid binding and soundhole ring, it's as light as a 1.5kg feather. Now that's a vintage V neck! It feels almost triangular in profile, and coupled with a one-and-three-quarter-inch nut and 25.5mm depth at the first fret, it's not for the feint, um, handed. We like it, but it certainly won't be to everyone's taste. "It has substance and character in abundance, and that's got to be down as much to the quality materials as the exacting nature of the design"
There's Collings-like fastidiousness in the immaculately cut-through bone saddle - again with wide, vintage-like string spacing - and the union of neck and fingerboard is wonderfully inviting, with expertly rolled edges that make it feel like home. The imperfect finish and glue globs around the lining challenge you to dislike it, but the sound... oh the sound! It's definitely a small-body voice; a focused midrange, no extensive bass, no glistening trebles. In lesser instruments, that would equate to 'boxy' sounding, but there's a depth and maturity to the Waterloo's timbre that immediately brings to mind the best country-blues-roots masters, whether they play(ed) a Kalamazoo or not; anyone from Robert Johnson, Mississippis Fred McDowell and John Hurt to Keb' Mo' and Eric Bibb. Like those artists, this guitar has gravitas; it has substance and character in abundance, and that's got to be down as much to the quality materials selection as it is to the exacting nature of the design and build (notice we didn't say 'finish'). It also records fantastically well - you're never cutting out swathes of bass to get it to sit in the mix, or indeed calming exuberant high end. It's an absolute world away from a 'modern', hi-fi-sounding guitar. Some people will love that, others much less so. The Waterloo WL-14 X by Collings Guitars is a real bag of contradictions that forces you to re-examine what's important to you about the guitar you choose. If you weren't of a mind to understand the intention behind this guitar, you'd point to the imperfections in its finish (not its build, just to be clear), and how that could never be justified at this price. You'd probably also point out that it's not much of an all-rounder, either: you might well be right on both counts. However, if vintage folk/country-blues tone is your bag and you want it as authentic as possible in a new guitar, the WL-14 X is a borderline no-brainer. The sound would sit perfectly well in the vast majority of contemporary rock and folk music, too, it should be said. We've been genuinely surprised at our reaction to a guitar that we were struggling to understand before we played it... and then we played it. And played it and played it and played it. If you get the chance, so should you.